Price fighter. 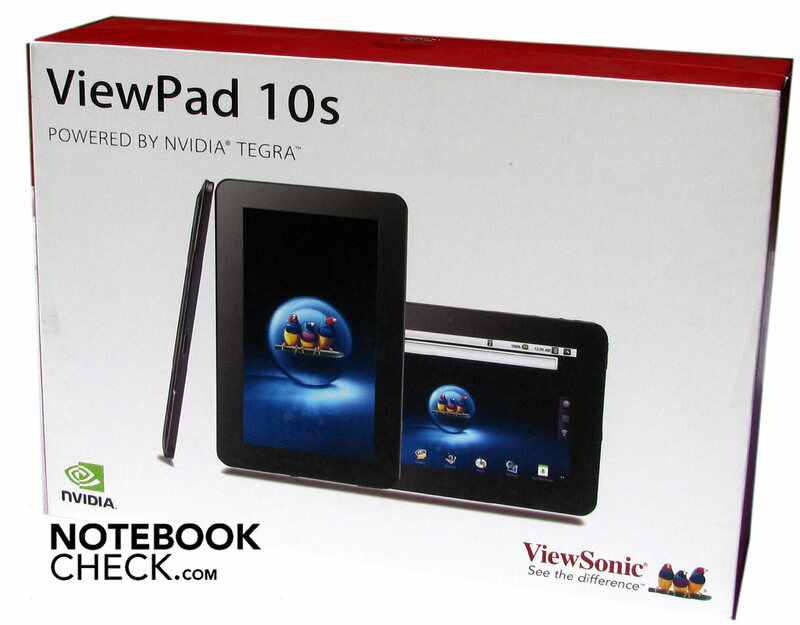 The ViewPad 10s has a 10.1 inch capacitive touchscreen and the dual core processor, Tegra 250, from nVIDIA. With that, it should provide up to 16 hours of mains independence. 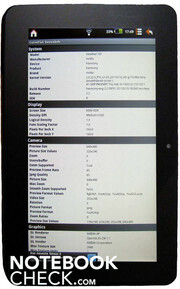 Google Android 2.2 is pre-installed as the operating system on the ViewPad 10s. 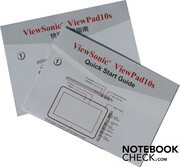 The ViewPad 10s is comparable with the Apple opponent, the iPad, in terms of size and weight. The display diagonal is a bit larger in the ViewPad 10s. 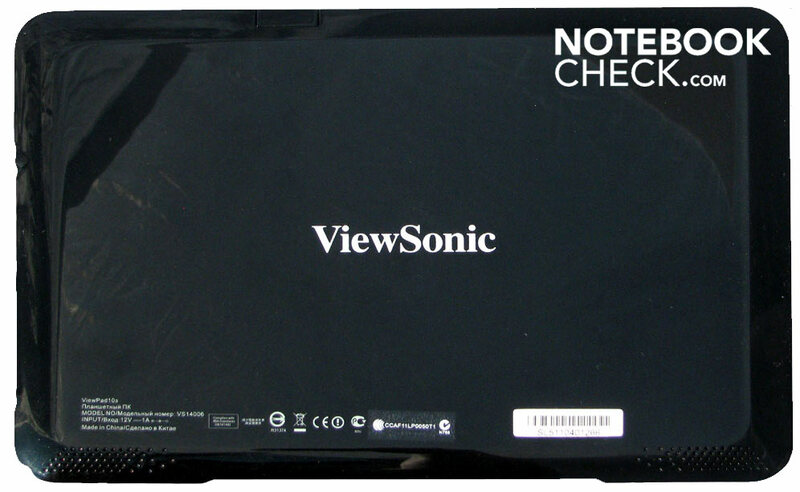 The Viewsonic has a screen diameter of 10.1 inches rather than 9.7 inches. The weight differences are marginal and almost equal. The biggest difference is found in the pad's dimensions. The device is notably larger and, in particular, thicker. In comparison, the iPad only measures 8.8 mm, the ViewPad 10s is almost twice as thick. According to the manufacturer, it is "only" 14.5 mm. But it feels a great deal thicker though. The ViewPad 10s's case is pleasant to hold despite its 768 grams. There is a lot of room for a secure hold on the case's right and left. The workmanship is acceptable and the pad's case is sufficiently stable. Every now and again, the upper and lower shells creak when the pad is pressed to hard. Black plastic is used as its material. Although it is plastic, pressure isn't passed onto the screen from the back. The sparse control elements are all on the right, respectively on the top. The ViewPad can't compete with the aluminum pad in any way in regards to materials and quality and is rather more in the Samsung Galaxy Tab's (7") league. All expansion interfaces are found on the right. The majority of these are beneath a plastic cover. 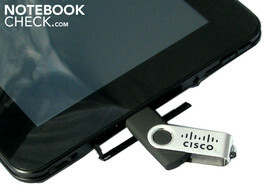 It reveals USB port, a cardreader for micro SD cards and a HDMI interface. Opening the cover is a riddle and a very finicky matter. The cover is kept in place by two magnets that have a tight grip. Almost too good to access the interfaces easily. We had a hard time to take off the cover in the test because of the magnetic force. It even gets harder when you want to pull out the microSD card. One hand has to hold the pad and bend the cover open at the same time. The inserted microSD card fits tight in the cardreader and has to be pressed in a bit. The card can be taken out after that. It's hardly possible to make things more complicated. Two controls are found on the pad's right for controlling the volume. A display shows up on the screen when they are pressed, which shows the volume level. The 3.5 mm socket for a headphone plug is also found here. In addition to the lateral elements, the ViewPad has a few switches for pressing and pushing on its top. The "Home" button is found here. It calls up the desktop view when it's triggered. However, running programs aren't closed, but only put into the background. The second key lets you go a step back within applications. Moreover, there is a slider with which the display's direction can be fixed. That means the displayed content doesn't rotate when the pad's position is altered, even if it's set otherwise in the settings. 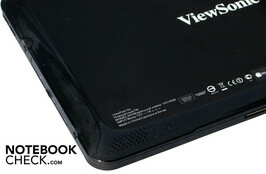 The ViewPad 10s has a docking station connector on its lower side. It will be offered optionally. However, looking around on the Internet hasn't led to any shop offering this docking station. 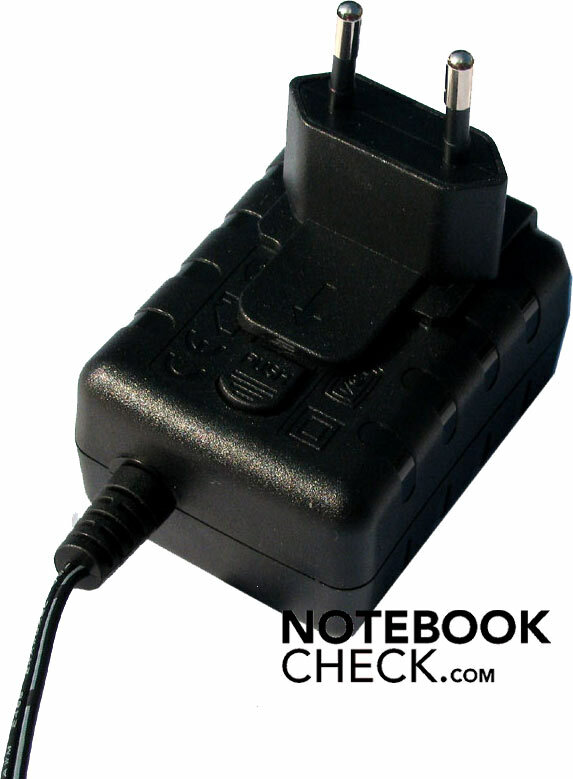 Beside the pad, there is a 120 gram light power adapter with various plug adapters included in the scope of delivery. 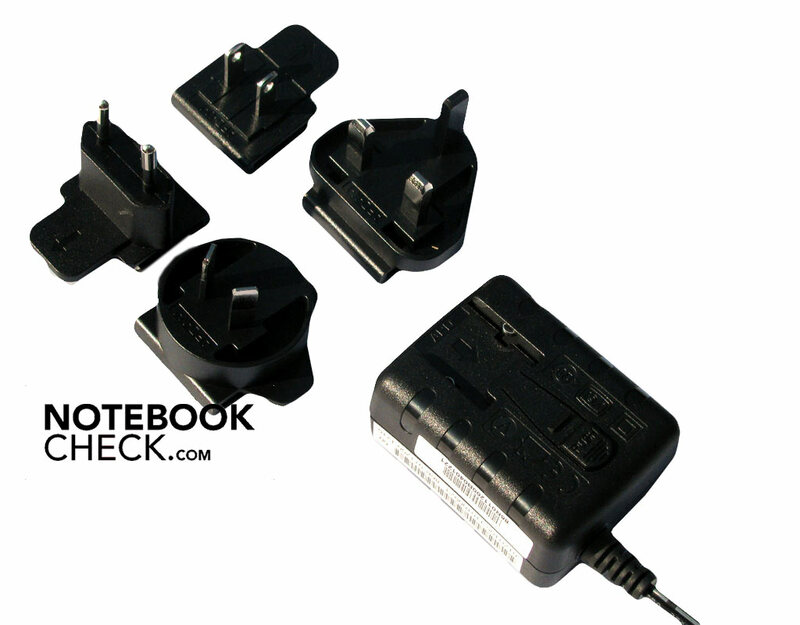 The pad can be used almost everywhere in the world with these adapters. The single plugs can be easily exchanged so that it fits in a variety of power outlets. Additionally, there are a few quick start sheets. However, they only explain the ViewPad 10s's connections. 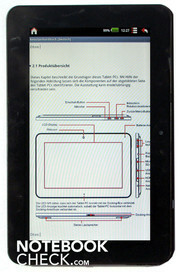 A comprehensive user's manual is installed on the pad. The warranty periods vary. Viewsonic grants a warranty of 2 years in D-A-CH. 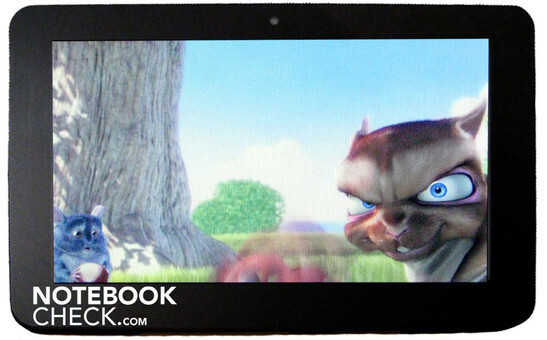 ViewPad 7 "Try for Free"
Viewsonic currently has a special campaign for everyone who would like to try a 7 inch pad. 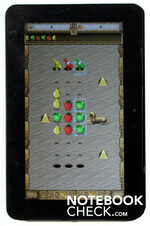 Consumers can return the ViewPad 7 within 4 weeks after purchasing it for free in the campaign "Try for Free". A maximum of 10 euros is remunerated for packaging and shipping expenses. The campaign runs from April 11th to May 15th, 2011. 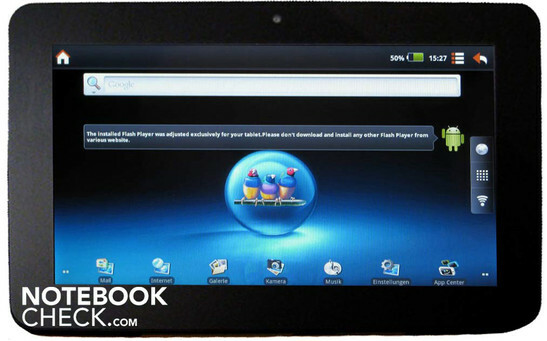 The tablet PC, ViewPad 7, is equipped with the Android 2.2 operating system, Bluetooth, WLAN and GPU. Moreover, it has a SIM card slot, which allows the pad to also be used for making telephone calls.. 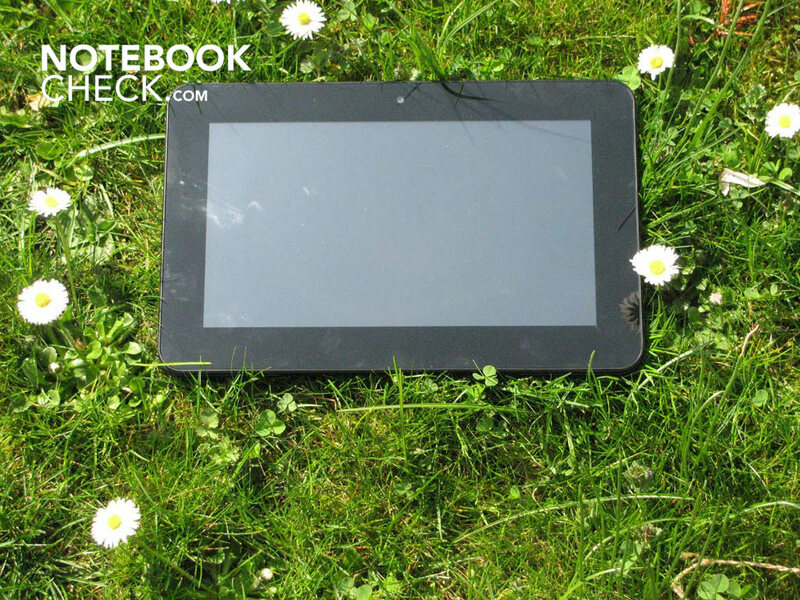 The ViewPad 10s is almost only used via the touch sensitive touchscreen. A part of the display is reserved for various status indicators. Aside the current time and wireless network status, the battery state is also displayed. In addition, there are two icons for "home" and "back". Both of these functions are also found as "real buttons" on the case. However, the use of these buttons is a bit complicated due to their positioning. The keys are – when the ViewPad 10s is used horizontally – on the pad's upper right. The right hand has to be relocated for using the Home, respectively Back button when the pad is held with both hands. The ViewPad 10s hasn't got a back key on the display front that can simply be used with the thumb. 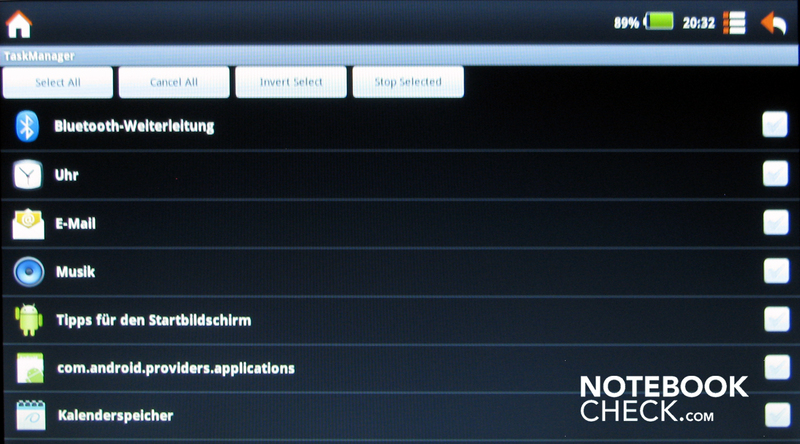 The pad's settings are well arranged and can be set in several languages. 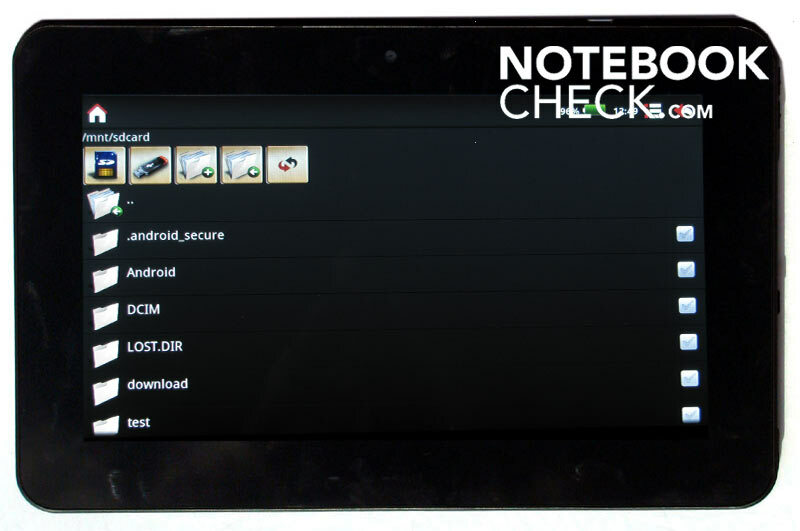 Viewsonic sticks to the default settings of the Android operating system. The terms are easy to understand so that even unpracticed users quickly find their way around. Wireless Internet access first has to be configured. WLAN access points within the device's range are listed by name and can be used. That is of course that you have the matching security key for that access point. Free hotspot access points, such as found in cafes, hotels or airports, are also detected and fade in via an info report. Internet can't be used after leaving the service area since there is no 3G support. This naturally also applies for checking or writing emails. A virtual QWERTY keyboard is faded in for text inputting. It is also used for writing emails. The capacitive display responds very quickly. Alternately, it is also possible to connect an external USB keyboard. 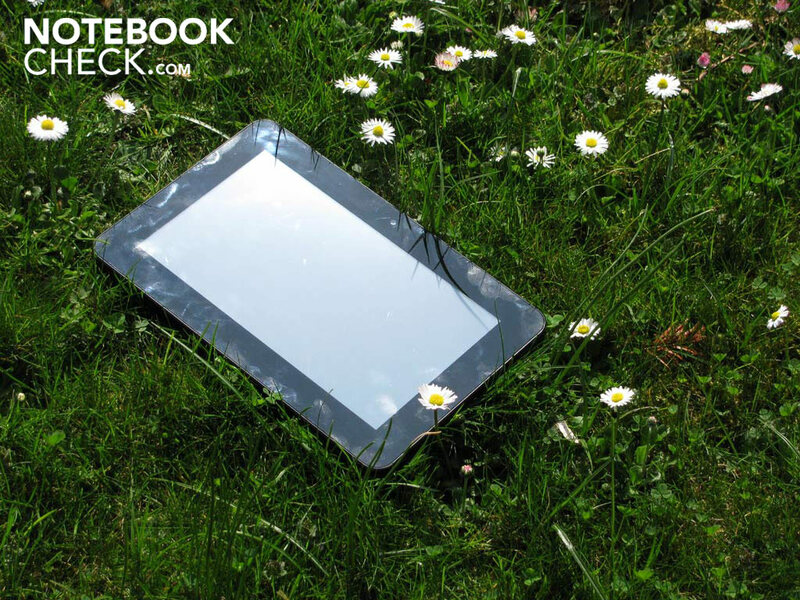 Alike all pads, the ViewPad 10s has a reflective display. That is noticed in the office or at home when the ceiling light is mirrored on the screen. It gets even worse outdoors. Reflections of the sun, respectively user, are inevitable. The pad can be used well as a mirror replacement for checking your hairdo. It will save you going to the ladies room in the beer garden. The backlight can be set in several brightness levels in the settings. It's even faster with the widgets for energy savings that standardly belong to the Android operating system. If the widget is placed on the desktop, three brightness levels can be selected directly. These widgets bid even more functions: WLAN and Bluetooth can be enabled/disabled quickly. 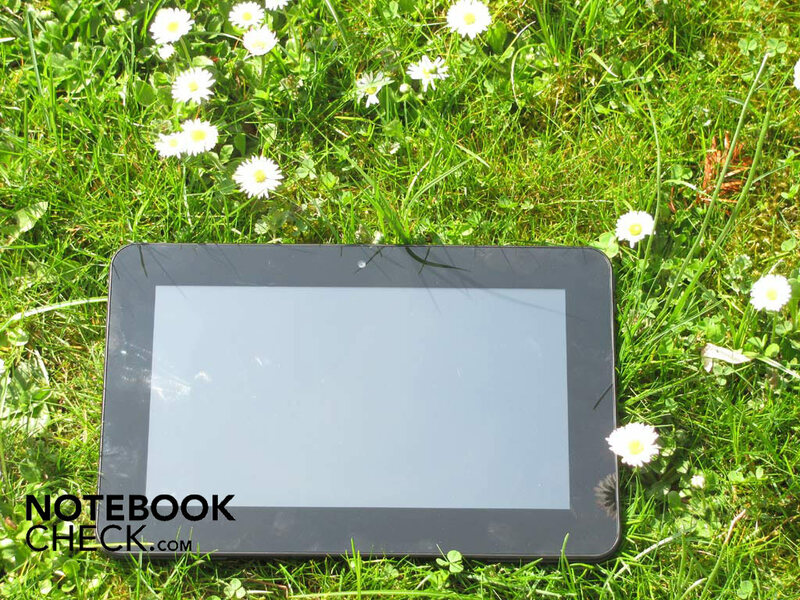 The tablet is about on par with current notebooks with a maximum brightness of 230 cd/m2. The brightness is sufficient for indoor use. It gets a bit more problematic outdoors. The ViewPad can't "excel" in terms of contrast where it is only below average with 133:1. Consequently, black looks rather like faded gray, as can also be seen on the following picture. The display immediately responds to finger inputs. Partly so fast that something is entered twice. Actions that aren't intended (at this moment) can also be triggered in games, for example in the Android classic "Angry Birds". The typical two finger gestures (zoom in / out) as known from the iPad are also possible. You quickly notice the 768 grams during video rendering. A prop doesn't belong to the ViewPad 10s's equipment. Especially the ViewPad 10s's surface is noticed adversely since it magically attracts fingerprints. A box of cleaning wipes should always be at hand for the pad because the display isn't very forgiving. 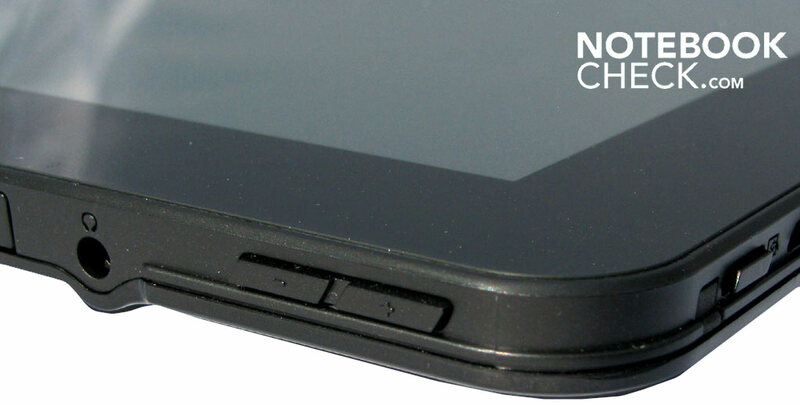 The case's black plastic doesn't forget any touches either. Perfect for police in case the pad is mixed up in a crime. 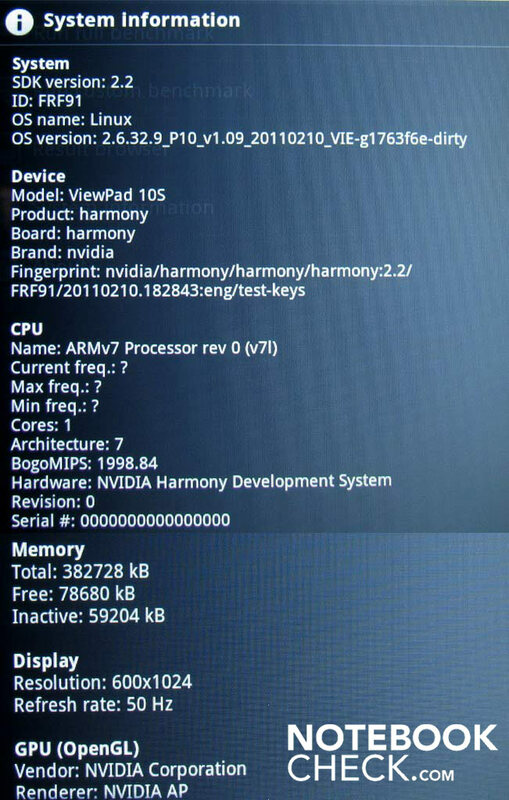 An ARM Cortex A9 from nVIDIA is used for the processor in the ViewPad 10s. 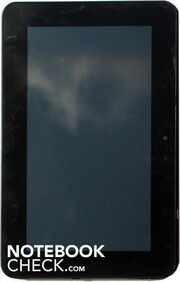 The Tegra 250 is designed as a dual core and is powered with 1 GHz. 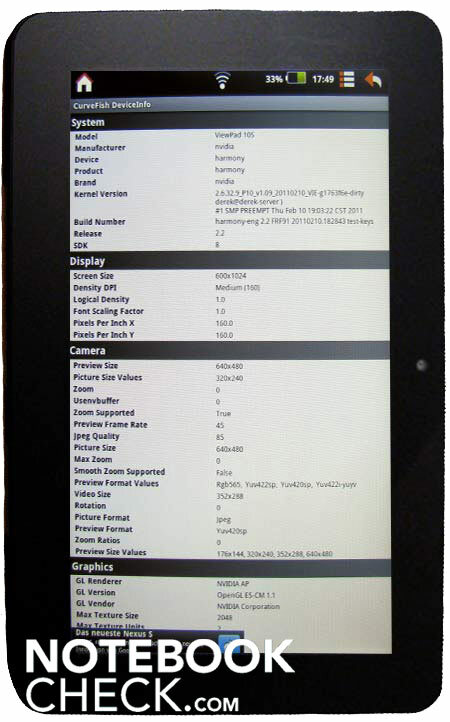 The tablet has a 512 MB SD RAM DDR2 memory as its RAM. An upgrade option to more RAM isn't presented. The capacitive 16:9 display supports multi-touch inputs. 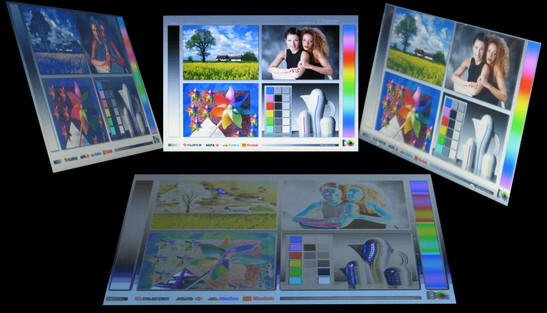 The backlit display has a resolution of 1024x600 pixels and supports 16.7 million colors. A 1.3 megapixel webcam is located above the display – when it's held horizontally. The ViewPad 10s has WLAN standard 802.11 b/g and Bluetooth 2.1+, including EDR technology for wireless connections. External hard disks, USB sticks or input devices, like keyboard or mouse, can be used directly with the ViewPad 10s via the lateral USB port. The pad can also be used as, for example, a video player on the "big" TFT via the HDMI port. The internal 512 MB ROM can be expanded with a micro SD card, easily and affordably. SDHC card currently have a maximum capacity of 32 GB and cost about 30 euros. The large display is predestined for surfing and rendering movies. Internet sites are reproduced well in the landscape mode, which has a resolution of 1024x600 pixels. It's possible to scroll quickly with one finger. The pivot mode (600x1024 pixels) is more suitable for changing the pad's settings. 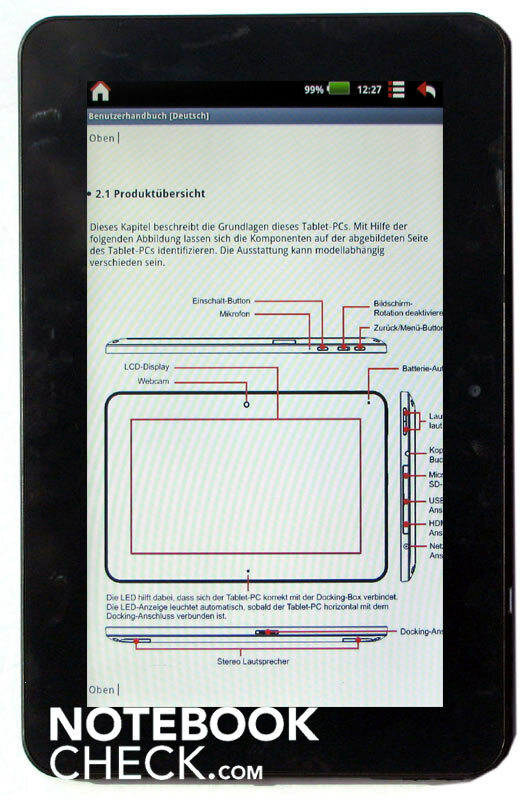 The ViewPad 10s's display content rotates automatically depending on the pad's position. Automatic rotating can be disabled in the settings or via the slider if this function isn't wanted. That is handy especially when watching videos or playing a game. Disabling the tilt and acceleration sensor would be fatal within games that use the automatic display switching. Music files can be played via the pre-installed player without problems. Prepared play lists are also supported by the audio player. Information about the artist, album and title is automatically read out via the audio files' ID3 tag. The player creates the according play list depending on how it is to be sorted. The ViewPad 10s doesn't have its own video player. Playing a video is either possible via the iFileManager or via a video player app. They can be found in a vast amount in various Android stores. Many video players can even be directly installed from the AppCenter – to a part even for free. 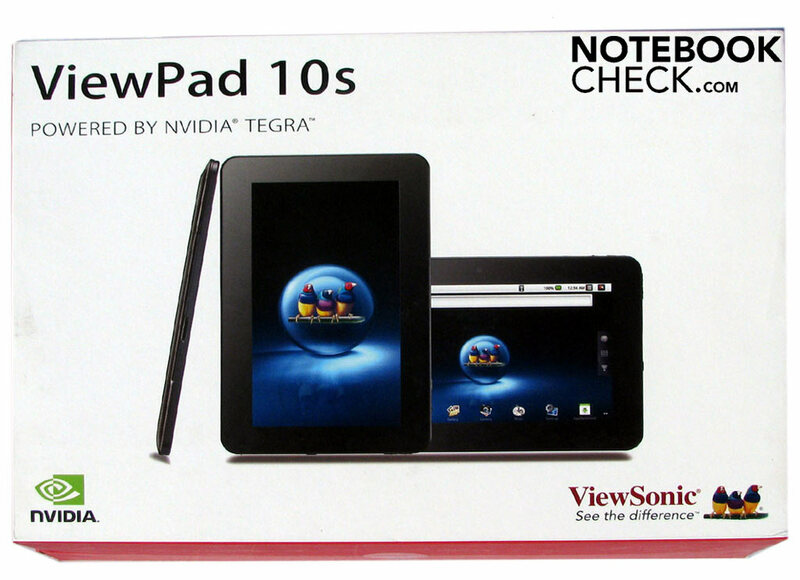 The ViewPad 10s supports all current video codes and formats up to a 1080p resolution. The ViewPad 10s can even be used as a video player for a larger screen via the HDMI port. 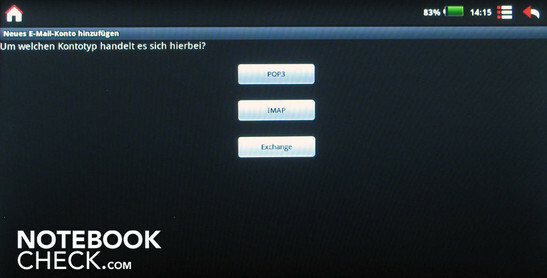 The incorporated email client supports POP3, IMAP or Exchange email accounts. 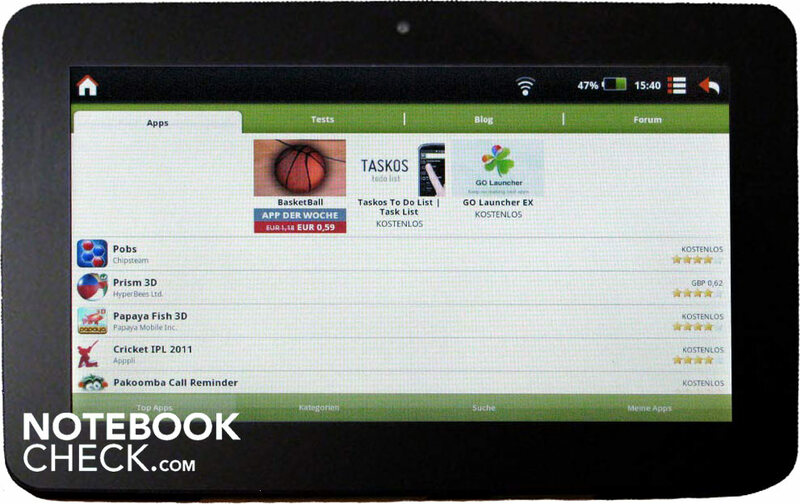 Even several different account types can be used at the same time on the ViewPad 10s. The email client fulfills all basic functions. Other email clients, such as "K9" can also be installed and used. However, a WLAN connection is still necessary for checking emails. Alternately, a smartphone can be used as an access point. But that depends on the model and telephone providers often don't approve of it. 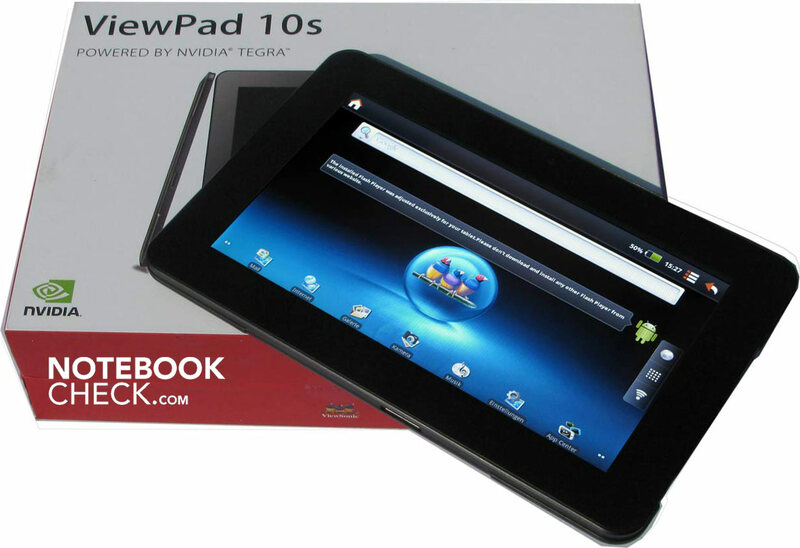 The ViewPad 10s is based on the Android 2.2 operating system and is thus compatible with almost all apps. A few programs are pre-installed in its state of delivery so that you can start right away. There is an email client, a calendar, a clock and a calculator. 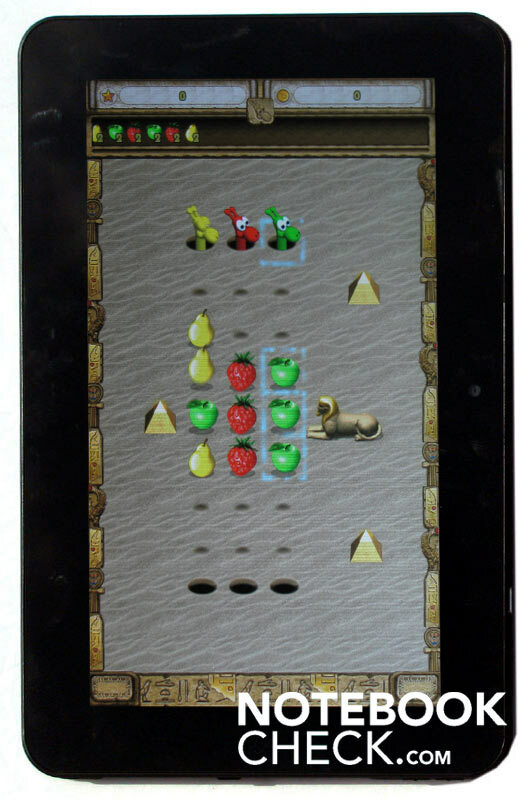 The ViewPad 10s connects to the AppStore from Android Pit via the App Center icon. A WLAN access point is mandatory for this. 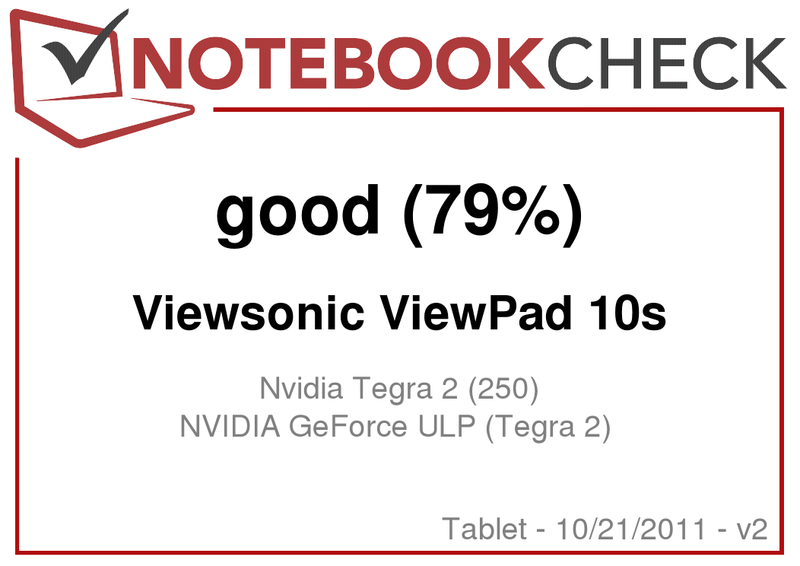 We noticed a few peculiarities in the beginning of the tests with the ViewPad. They ran without problems after installation but started to crash more frequently in the course of time. The more apps were installed and opened on the pad, the more incompatible the ViewPad 10s got. In the beginning we thought that it must be a virus. However, various virus scanners showed that the pad was virus free. In order to find the fault, the ViewPad 10s was frequently set back to the state of delivery. All data, apps and settings were deleted every time. Newly installed apps ran perfectly and without crashes again. First, in the course of various test, could we detect the guilty party. It is no other than the pad that makes itself problems with the applications. Programs or games that had been closed via the home button weren't closed in the memory. The more apps we successively opened, the less memory was available. Android apps may be relatively small, but even 512 MB of flash memory is filled. The operating system's task manager could help here. Single or even all running tasks can be closed with it. This indirect route isn't elegant, but it does the job. Apps that didn't want to run without using the task manager ran without problems with a cleared memory. The device works completely without a fan and is thus absolutely silent. No annoying fan or clicking hard disk has been installed into the pad. The power loss of CPU, graphics or battery is hardly noticeable. A "heat source" is merely found on the flipside while charging the battery. But that's normal when charging a battery. However, the device always remained within a lukewarm temperature range during use. (+) The maximum temperature on the upper side is 34.9 °C / 95 F, compared to the average of 34.8 °C / 95 F, ranging from 22.2 to 51.8 °C for the class Tablet. The ViewPad 10s has two built-in speakers with 1.5 watts each for sound emission. They are located on the flipside and emit a good sound. The volume can be controlled via two speaker controls. A headphone can also be connected via the 3.5 mm audio socket. 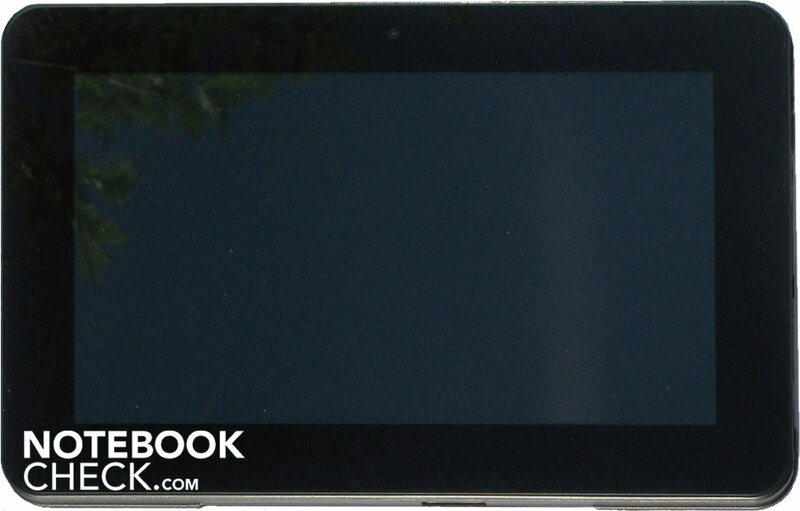 There is a battery pack based on lithium-ion in the ViewPad 10s. They have a charge capacity of 3300mAh. According to the manufacturer's specs, they are supposed to last for up to 7 hours. It's even allegedly about 16 hours when the pad is solely used as a music player. That sounds good and we want to check it out. To determine the battery life, the pad was first charged for several hours. The ViewPad shows the battery charge state via a small indicator. After reaching 100% of capacity, we added WLAN for the first run through. The display's brightness was set to maximum. We visited a video site via the web browser. 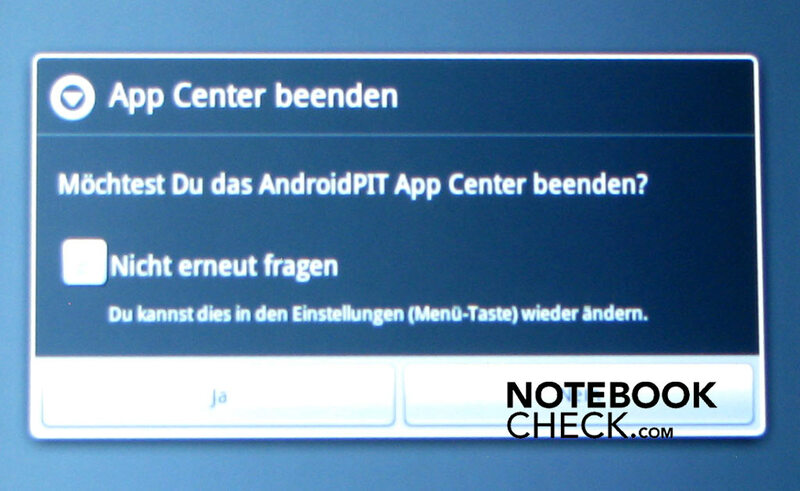 We haven't yet any programs similar to those for notebooks for testing the battery life of tablet PCs with Android. We didn't use a stopwatch because the Android operating system records how long it runs. A 90 minute video was started. It was streamed via WLAN and the Internet access point, and it put the CPU, graphics and WLAN under simultaneous load. An anti-virus program had to check the pad for infections as a second tool. This method was repeated until the battery warned us. The pad made itself noticeable with a warning that the battery was almost drained after 4 hours and 44 minutes. A good point to record the pad's minimum battery life. 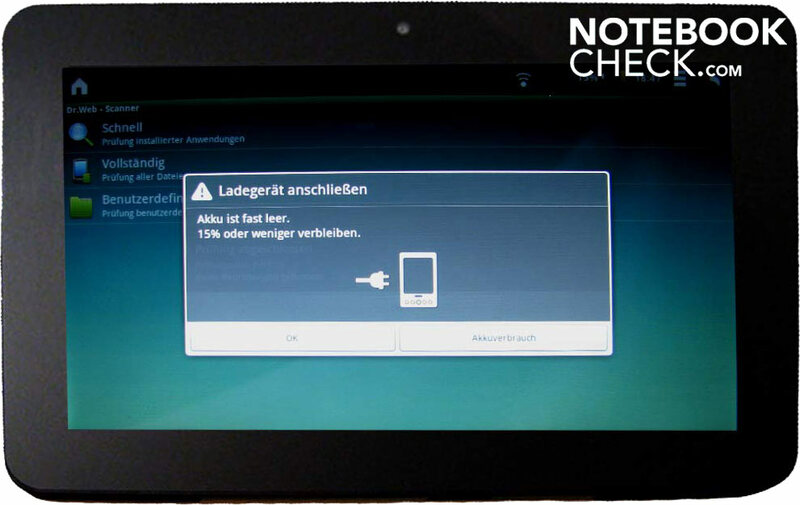 The ViewPad 10s lasted for almost 45 minutes longer without WLAN. The battery life can also be increased by reducing the brightness. The setting without WLAN in brightness level 1 achieved a battery runtime of 6 hours and 25 minutes. The batteries in the Viewsonic Pad need a very long time to recharge. The ViewPad needed good 5 hours for a full recharge after every single test. This means 5 hours of pad use equals 5 hours of charge time. The pad naturally can be used while it's being charged. If you can ignore the minor flaws, the pad is a perfect companion on the go, video player or Internet client. However, you always need a WLAN access point for checking emails or the updates from your social network since it doesn't have 3G support. The ViewPad 10s is very contact-friendly with the USB port, HDMI socket and microSD cardreader. The device has a USB 2.0 port standard type A, as known from notebooks or PCs, rather than a mini USB port like common in many models. 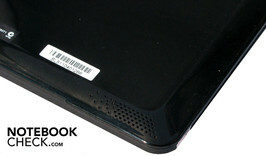 This allows connecting USB sticks or external hard disks to the system. The Android 2.2 operating system detected various USB hard disks, USB sticks or keyboard right away. There is one USB, one HDMI socket and one microSD cardreader behind this cover. The display mirrors a lot from the surroundings. 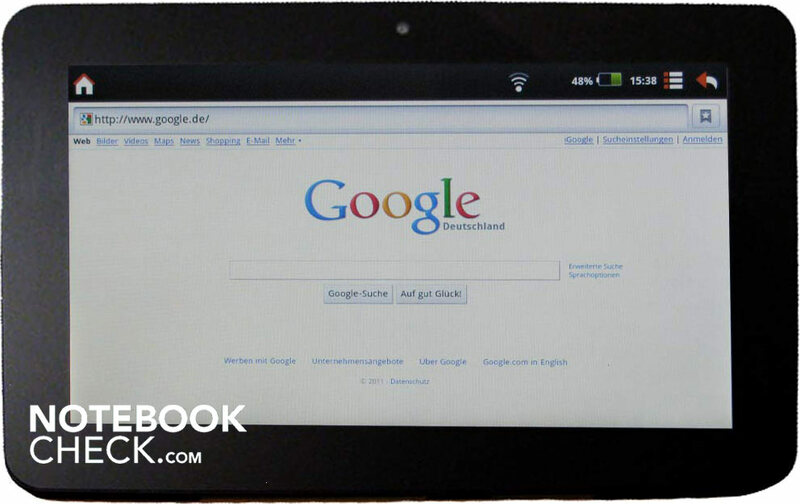 Websites are displayed like on a notebook. A comprehensive manual can be found on the pad. 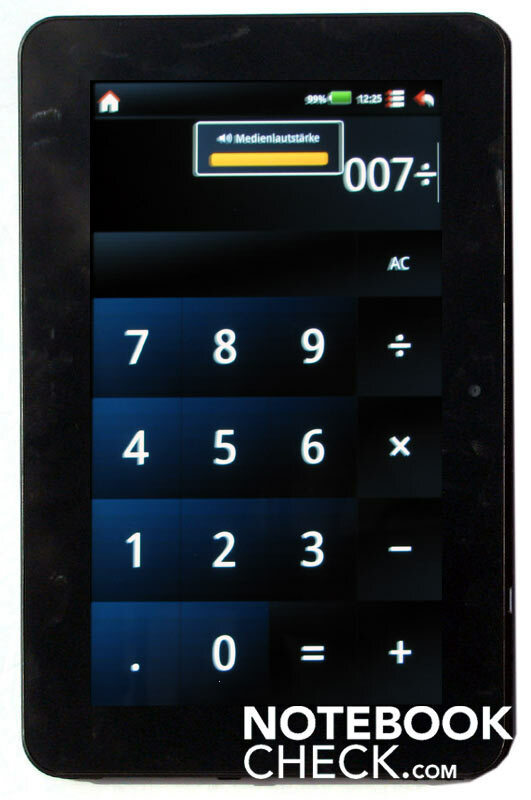 It can also be used as an oversized calculator in a 10.1 inch format. Filed can be copied, moved or deleted via iFileManager. 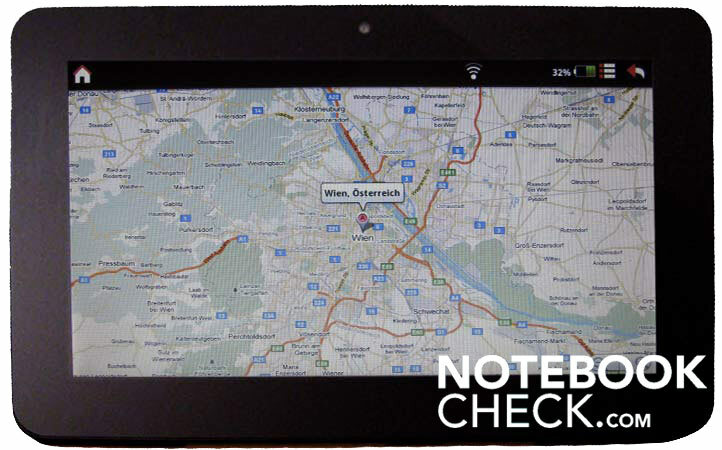 Google map can only be used to an extent on the pad. Port for a docking station. Power adapter for the ViewPad 10s. Additionally installed apps show all pad info. This question is definitely not asked often enough in Android apps. The capacitive touchscreen responds very fast. Multi-touch inputs are possible. USB sticks or hard disks can be used directly with the full-fledged USB port standard type A. 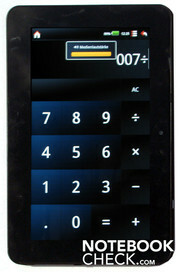 The ViewPad 10s lacks a "back" button located beside the 10.1 inch display and which can be used with the right thumb. A GPS module for localization would also be a neat gimmick in the ViewPad 10s. UMTS for mobile users. 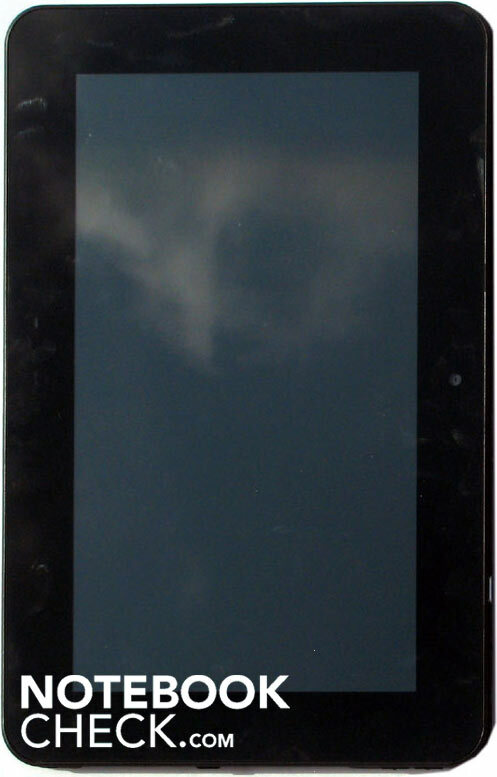 In a similar price range: Archos 101, Creative Ziio 7". For Windows fans: Asus Eee Slate EP121. The classic: Apple iPad 1 and its heir Apple iPad 2.